As you grow in your walk with Christ, one of the most important things you’ll need to do is nurture your relationship with Him. Similar to our relationships with our children, friends, family, significant others, and so on, if you want to grow closer to God, you must spend some time with Him. 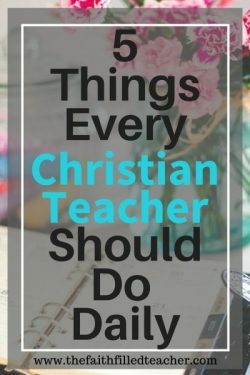 Between lesson planning, meetings, taking care of your household, carving out time for your spouse/children, church events, and just life in general, fitting in quality time with God can easily take the back burner. There are so many reasons why you need to invest time in the Word of God and in His presence. Knowing God is more than just quoting scripture and going to church. There is so much that God wants to reveal to you, victories God wants you to have and fresh revelation of His Word that you need to hear. This knowledge can only be revealed through hearing from God. 2 Peter 3:18 tells us to grow in the grace and knowledge of our Lord Jesus Christ. Lack of time spent in the Word and time in prayer is one of the biggest reasons why so many Christians are walking around defeated, drained, and powerless! I don’t know about you, but a lack of time spent at the feet of Jesus definitely affects my mood. I’m a better teacher, mom, wife, and friend when I’ve spent valuable time in the presence of God. Him…when you ask Him for advice…when you take the time to listen to Him and to just. Be. Still. So how can you make sure that you aren’t shortchanging God in quality time? Well, here are 9 simple ways to fit in more quiet time with God. Yes, pencil in your time with God. Time is one of the greatest, yet most mismanaged tools God has given us. I find that when I purposely put things on my schedule and plan things out, my day just goes smoother and I am more apt to carry out the things I need to get done. We use planners, calendars, and alarms for so many things in our lives, so why not use these tools to schedule in your God time? 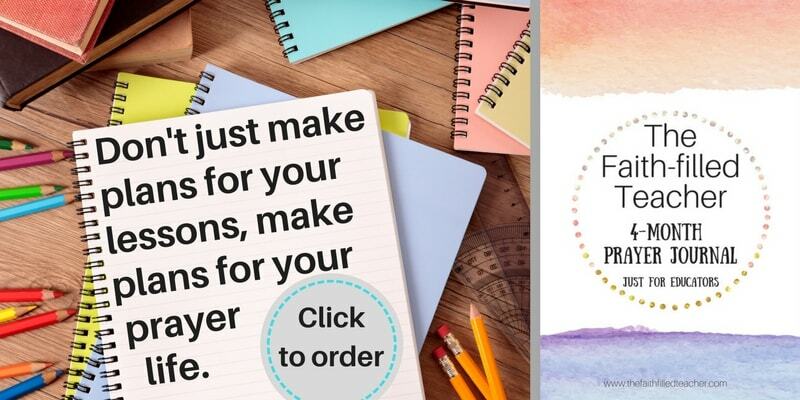 If you use a pencil/paper planner, you can actually write down when you’ll have your quiet time as you schedule out your day. Set a daily time that you will have your quiet time with God. For example, you could set aside every day at 7 a.m. or every day at 8:30 p.m. as your designated time for God. Set your designated time in your cell phone alarm as a reminder. Whatever scheduling method you decide to use, I highly recommend you start your day with God and spend the first few moments of your day with Him. What you do in the morning will set the tone for the rest of your day. It will give you the opportunity to set your mind on God and His Word and it will give you something to think on throughout the day. Remember, eating your “spiritual breakfast” really is the most important meal of the day. Some days at school are just a whirlwind. There are so many tasks to get completed in a short amount of time. Why not take a few minutes to pause and focus on God? 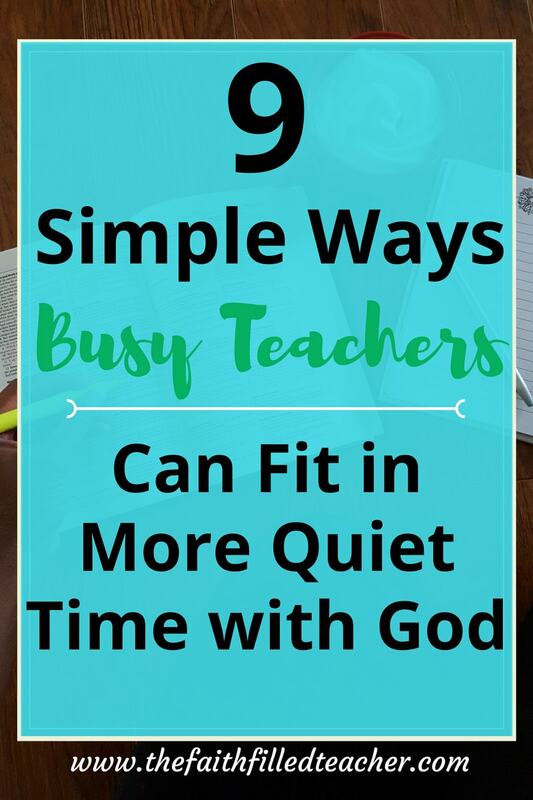 You can use your lunch time or planning time to fit in more quiet time with Him. You can use this time a few different ways. You could take one or two days a week and designate them as the days you will spend your lunchtime with God by reading the Bible or an inspirational book, or praying. You could also split your lunch time. For example, if you have a 30-minute lunch, you could set aside the first 5 minutes or the last 10 minutes of your lunch as time with God. I know planning time is precious, but you could definitely use a little of this time to get in a little time with God. Take a few minutes to reflect on the devotional you read in the morning or turn on some worship music or a sermon while you work in your room. 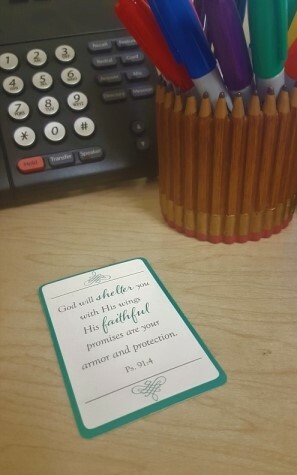 Post a scripture at your desk to give yourself little glimpses of God throughout your day. Taking this little respite in the middle of the day will greatly benefit you, and hopefully, put you in a better mindset to be at your best in the classroom. Mornings and evenings are a great time to fit in more quiet time with God. Set your alarm and wake up 15 or 20 minutes (or more) earlier than normal and set that time aside to do your devotional, pray, and have quiet time. If you’re like me and you’re a night owl, setting aside some of your time in the evening for quiet time with God also works well. How many of you find yourself watching television or perusing Facebook or Instagram before bed? Instead of doing those things you could use those last few minutes before bed spending time with God. Find some scriptures that pertain to you or a situation you’re going through and meditate on the scripture before bed. By meditating I mean, say the scripture a few times, close your eyes and think about the words, focus on the promise, pray the scripture, and visualize yourself living out the words of that scripture. Your commute to work is another time that you could spend having some quiet time with God. Whether that be driving in your car, or riding on the bus or subway, you could easily spend at least 30 minutes a day commuting (and that’s on the low end!). If you do that Monday-Friday, that’s 150 minutes, which is 2 and a half hours! That is a lot of time! Think of what you could do to take advantage of all that time. Instead of just listening to music, listen to an audio of the Bible, a sermon, or podcast. If you ride the bus or subway you could read the Bible or an inspirational book. You don’t have to do this every day, but what if you decided that your time going to work each day was spent focused on God. Then you could decide that each day going back home could be your time to veg out or listen to music. Even if you did it one day a week, that would be an extra 30 minutes of time devoted to God. One thing I love to do is just turn off the music and just have silence in the car. Yes, silence. It’s great, (especially if you have children and don’t get a lot of quiet time to yourself). 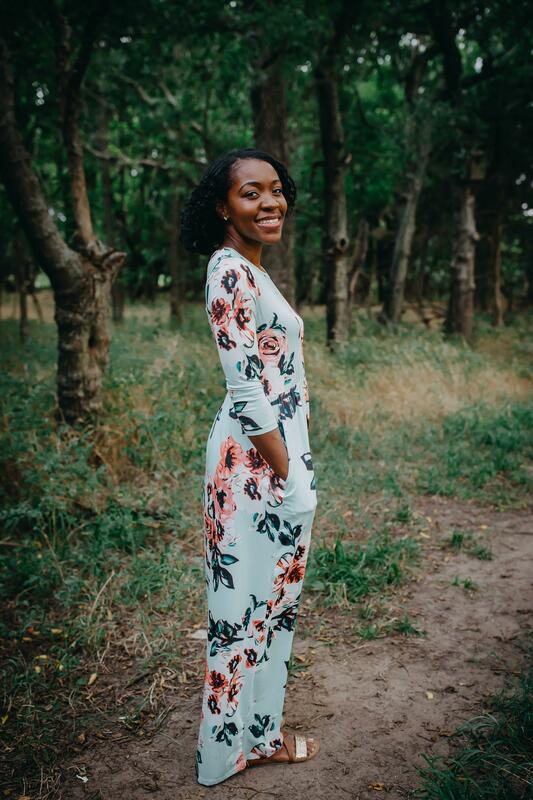 Just being still and having that silence can allow you to talk to God and have some time to listen to His voice and think about what He is speaking to your heart. Whichever method you decide to use during your commute time, I recommend praying a short prayer before you enter your workplace. This will help set the tone for your day and give Satan his “NOT TODAY” notice. This is a big one. We live in a day in age where the use of technology is becoming more and more the norm. There are so many devices and apps today that it can really overtake your idle time if you’re not careful. Some of us are more devoted to what I call SMM (social media ministry) than to our own personal ministry! I’m not talking about people who actually use social media to minister the Gospel, I’m talking about the mindless time we waste on social media. There’s Facebook, Twitter, Instagram, Periscope, Snapchat, and the list goes on. You could literally spend hours a day on social media. It’s crazy because I’ve noticed that when I have an idle moment, I find myself just grabbing for my phone and checking Facebook or Pinterest like I’m some zombie – it’s sort of like a habit now! I have to make sure I’m always conscious of the time I spend using my phone. Time yourself and figure out how much time you’re spending on social media. For Facebook, I recommend an app called Timer in Facebook. It will actually keep track of the time you’re using Facebook and give you hourly, daily, weekly and monthly totals. You may be surprised at how much time you’re spending on social media once you time yourself. And then if you think about that time multiplied by 7 days a week, it can really add up fast. Then think…hmm, what if I spent half of that time reading my bible? It really makes you think! Set a social media time limit for yourself and stick to it! Once you’ve reached your time limit for the day, logout of your social media accounts and make a conscious effort NOT to sign in. Once I reach my social media time limit, I put my phone away totally so I don’t feel tempted to log in at all. Use a day planner or other scheduling tool to plan out your day and set time frames for when you want to get things done. If you’re on somewhat of a schedule you’ll be less likely to pick up your phone during idle moments. Have a social media free day/week. Pick one day a week (or a whole week) designated as the time that you will not engage on ANY social media. You can do this! Log out of your social media or better yet, temporarily delete the apps from your phone to lessen the temptation to log on. I actually find it quite refreshing when I do these mini social media fasts. Set parameters for yourself as far as times that you can use social media and only do social media between those certain hours of the day. For example, decide that you will only get on social media after school and that you’ll cease from using social media by 9 pm. The time that you take to tidy up your home is a perfect opportunity to squeeze in some quiet time with God. While doing the dishes or folding laundry listen to a sermon or worship music. Cleaning your home is also the perfect time to pray. Remember, praying is simple talking to God and allowing Him to talk to you. So no, you don’t need to be on your knees with your eyes closed to pray. Just talk to God as if He were sitting right in the room with you. Along with social media, television is also a distraction that can easily get in the way of time spent with God. It’s so easy to sit down and say you’re going to watch a show. Then before you know it you’ve watched not one, but two and maybe 3 episodes. Oops! I’m not saying there is anything wrong with watching television, but it is one of those things that can easily creep in and take over your time if you’re not careful. I challenge you to add up the amount of time you’ve spent watching television over the past week compared to your time spent with God. Now take the time watching television over the last week and multiply it by 4…that would be your average over a month of time. Let’s say you spend 2 hours a day watching television, that would be an average of 14 hours a week (2 x 7 days). In a month that would be 56 hours (14 x 4). Not to mention time spent on social media. Makes ya think, huh? If you cut the amount of time spent watching television in half, that would free up 28 hours. With that time you could spend more quiet time with God and time to work on other projects, like starting up a business, writing a book, or doing some leisure reading. I love the idea of posting scriptures in areas that I frequent throughout my day. Write out your own scripture or to save a little time, use these inexpensive scripture cards. A friend bought these for me, and I love being able to flip through them and find one I like to post in my home or classroom. You could post these in your car, on your desk, bathroom mirror, refrigerator, you name it. I personally like to have a scripture posted somewhere in my home AND at my desk at school. 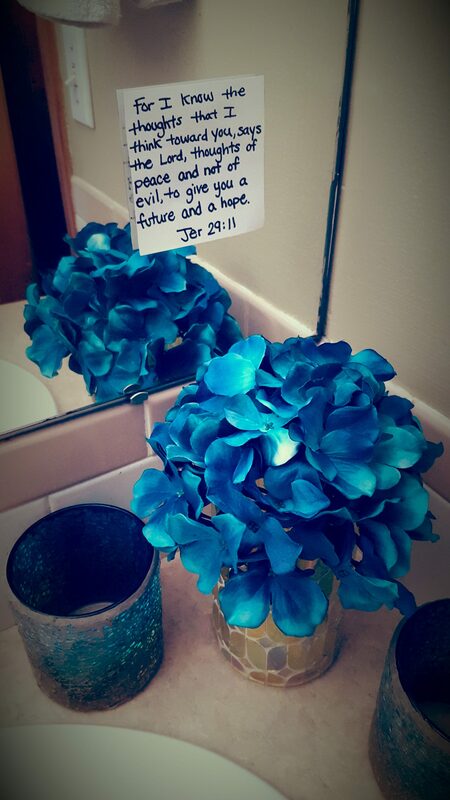 Here is a scripture I posted on my bathroom mirror. When you see the scripture take a minute to look at it, read it out loud, meditate on what it says and declare that scripture over whatever situation you’re going through in your life. Yes, put on your blinders. What do I mean by that? 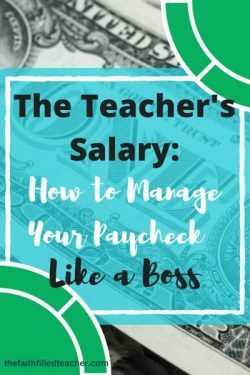 I mean just for a few moments, forget about that stack of papers that needs to be graded, the emails that you need to respond to, the phone calls you need to make, or the sink full of dishes at home. Yes my fellow busy teacher, just for a few moments let that stuff go and focus on God. All of that stuff will still be there once you’re done. Don’t have the Martha syndrome! Don’t get so busy tending to the house that you neglect to spend time at the feet of Jesus. Trust me, I know it’s hard. But, leave those things aside briefly and steal away some time with your Creator. I promise you won’t regret it. It’s not that we don’t have the time to spend with God, most of the time it’s that we don’t make time. The great thing about spending quiet time with God is that you don’t have to spend hours and hours a day praying and reading the Bible. There is absolutely nothing wrong with doing that, but, any time spent in the Word or in God’s presence is a good use of time. When it comes down to quiet time with God, it really is quality over quantity. But don’t stop at just stealing away these little moments. I don’t think snacking on the Word of God all day is what’s going to give you the best spiritual nourishment. You also need to take the time to have a daily meal-sized portion of His Word too! So how much time should you spend reading the Word and praying? Well, that’s really a personal call. You must seek God about how much time you need with Him. I can assure you, though, the more time you spend with Him, the more close and intimate your relationship with Him will be. I don’t know about you, but I don’t want a surface level relationship with God. I want that up close and personal relationship that He desires.